Topic: Are we due for new wheels? Re: Are we due for new wheels? If they're getting ready to update the molds, I would love for the wheels to come with some kind of witness marks inside of the wheel to help dissuade people from doing internal weight removal. Here's his final product. Just looking at that wheelbase hurts. Hope we tuned it right! CSB “shape n race kits! Off set 7/32 inch deep axle slots..
With a wheel base of 3-11/16 inches. From a performance perspective, that's pretty crazy. It does make for more realistic looking cars when coupled with fenders, though. Glad my family isn't building cars for that race. Also deliberately prohibiting rail riding? Duuuumb. 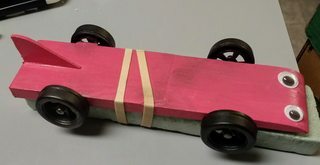 I guess the Pinewood Derby community isn't a large enough consumer to sway the minds of a big industrial giant. Topic: Is teflon dry lub compatible with graphite? I really like those cars in this month's gallery! Very creative incorporation of fenders into a design that actually looks like a race car!